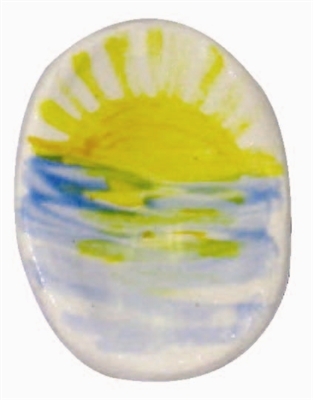 This individually hand-crafted Beginnings & Completions Stone is made of durable glazed pottery which can last a lifetime. At about 1.5 inches, it is sized to fit in a pocket, blessing bowl, or a faith chest. Purchase one or more to gift to others as a meaningful reminder of this special moment. This stone is included in the Blessing Bowl set for Meaningful Moments. In blessing new beginnings or completions we are reminded that a God who is familiar with us meets us in unfamiliar places. The creation story in Genesis states that every day had a sunrise and a sunset, "And there was evening and there was morning." This Beginnings and Completions stone for gifting is a wonderful keepsake to celebrate the beginning and completion of significant accomplishments and the special memories of the day.